Nine cylindrical glasses sit silently on top of a wooden table. The glasses are tall, transparent, and are arranged in a strict straight line. This silent frame is woken up with a hand that enters the frame with a shiny steel shaker; the hand proceeds to pour the contents of the shaker into the transparent glasses. As the shaker empties its contents into the cylindrical glasses, one would expect that the glasses be filled with a cocktail that is similar in color and nature. The glasses, however, reflect a different and surprising twist to this cocktail tale. The first glass is filled with a soothing green colored cocktail. The next glass is filled, not with a similar green colored cocktail, but with a brew which is a lighter shade of green. In the third glass, the color of the cocktail is a mix of green and yellow. This trend repeats over the remaining glasses with the color of the brew changing in each glass. What started out as a cool green cocktail ends up being a peach colored brew when the ninth glass is filled up. Is it magic? You may wonder. Surely, the steel shaker is a fantasy device that can pour different colored cocktails at the twist of a wrist. Otherwise, how can there be a logical explanation to an ordinary cocktail mixer pouring different colored drinks in one smooth motion. The truth, at times, can seem stranger than fiction. 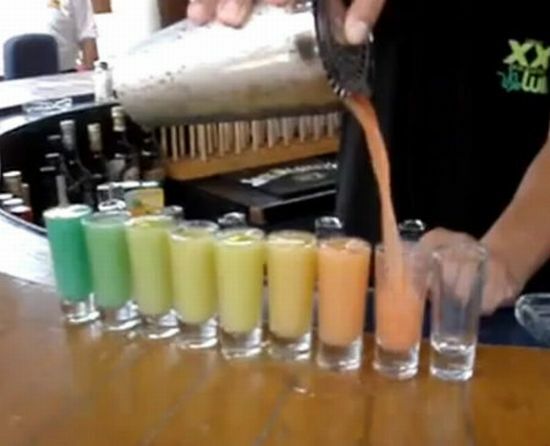 The shaker pouring different colored drinks into the nine sitting glasses is no magic. It is very much an earthly phenomenon related to densities of different liqueurs and the omnipresent force of gravity. The official name for this cocktail phenomenon is ‘Layering’. When you pour different liqueurs such as amaretto, schnapps, and tequila into a shaker, the various liqueurs will settle gently on top of each other forming layers. The layering occurs due to the specific density of each liqueur: the tequila is the lightest and settles on top followed by the schnapps and amaretto. With gravity pulling on the liqueurs, they settle in neat layers. This cool bartending trick can be easily performed to impress your party-go-lucky friends. Pour liqueurs that have different densities into the cocktail shaker. Keep in mind that the liqueur that has the maximum density needs to be poured in first followed by ‘lighter’ liqueurs. Then gently pour the mix into the glasses. Your friends will be amazed at your newfound bartending prowess. Also go through Magical Massage Gloves and Weird Magnetic Bucky Balls, if you are eager to learn few tricks to flaunt them in the upcoming events at your home.